WPI and partners in Israel tap into a shared culture of innovation and collaboration to engage students in projects with start-up companies and research into cybersecurity, energy, water, and more. Worcester Polytechnic Institute (WPI), a leader in project-based education, has announced a new project center in Israel, formalizing a growing collaboration focused on innovation in the STEM fields. In January 2017, the first team of six students will travel with a faculty advisor to Be’er Sheva and Eilat and will focus on solving local problems relating to cybersecurity, water, and energy, along with other issues. WPI president Laurie Leshin announced the new project center today at the U.S.-Israel Growth Summit while traveling in Israel as part of a delegation led by Massachusetts governor Charlie Baker to strengthen ties with Israeli companies. There are currently 130 companies with Israeli founders or Israeli-licensed technologies established in Massachusetts, representing significant revenue and jobs in the state, many in clean tech, life sciences, water technology, and information technology. Israel launches more start-up companies per capita than any other country in the world. Be’er Sheva, situated on the northern edge of the Negev desert and home to Ben Gurion University, is quickly becoming a significant world cyber hub. There, two WPI students, both in computer science, will work with area start-up companies on improving cybersecurity. 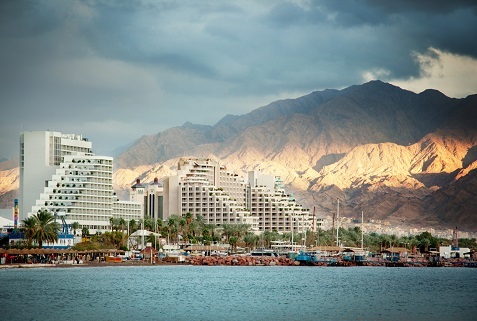 In Eilat, near the Red Sea at the southernmost tip of Israel, four students—three in mechanical engineering and one in electrical engineering, will work with Arava Institute, an environmental research organization. They will focus on projects related to desalination and solar energy. A hallmark of the Arava Institute is its cross-border focus that fosters better Israeli-Palestinian relations. The Institute trains students from Israel, Palestine, Jordan, and other countries, and instills a proactive program to manage conflict. There, Bar-On says, environmental issues are understood to be more important than political divides. In addition to working on environmental topics, WPI students will gain conflict-management skills. WPI students will also explore the rich history of the area through visits to geographical and archeological sites, such as the Dead Sea, the Ramon Crater in Israel’s largest national park, Jerusalem, Tel Aviv, and Caesarea, the city built by Herod the Great in 25–13 BC. All WPI students have the opportunity to work at one of the university’s project centers located in 28 countries across the globe, including the United States, where they research and develop solutions to real-world problems that lie at the intersection of science, technology, social issues, and human need. Following a study tour and other visits, it became clear to faculty and board leadership that there were opportunities for WPI students to immerse themselves in this uniquely innovative environment, as well as opportunities for Israeli organizations to benefit from the engineering skills of WPI students. Through the project centers, students complete their Interactive Qualifying Projects (IQPs) and Major Qualifying Projects (MQPs), which are required for graduation. Undertaken in the junior and senior years, these projects provide WPI students with opportunities to apply classroom- and lab-acquired knowledge to solve real-world problems either on or off campus. The IQP facilitates teams of juniors who tackle societal issues related to science and technology; The MQP challenges seniors to solve problems typical of those encountered in their professional discipline. WPI combines these unique educational programs with a research emphasis on local and regional sustainable development that focuses on the strategies and needs of governmental and non-governmental agencies engaged in the challenge of creating healthy, prosperous, and environmentally responsible localities and regions around the globe. For more than three decades, WPI has sent a higher percentage of its engineering and science students off campus and abroad for academic research than any other university in the United States. To date, more than 10,000 students have participated in off-campus projects—currently over 800 each year—and scores of faculty members have served as advisors for the programs. WPI recently opened or expanded project centers in Ecuador and Panama, as well as in Worcester, England, and is exploring potential project centers at other sites around the world, and is increasing enrollment at existing sites as part of the university’s strategic plan. WPI is also a committed partner of the Institute of International Education’s Generation Study Abroad Initiative, which is a nationwide push to double the number of American students who study in foreign countries. In 2016 the Princeton Review ranked WPI the top university in the nation for the “most popular study abroad program”; WPI was the only technological university in the top 20 in that category. A map of WPI project centers can be found at wpi.edu/+intheworld .